Back before I was a knitter, I once attended a craft fair with my mom. There was a lady there who was selling crocheted hats. I bought this adorable little bowler style hat, with the idea in mind that I would replicate it. It’s sadly misshapen these days, but I still love it. In concept, it’s one of my favorites. Sadly, not long after this, I stopped crocheting in favor of knitting. 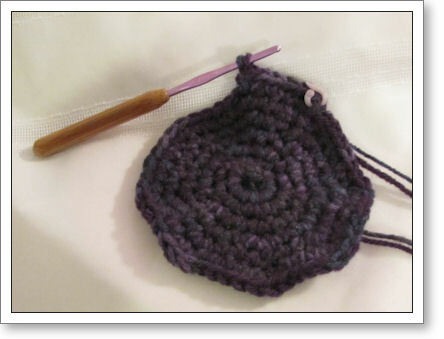 I had hurt my hands badly with the twisting motion of crochet, and learned to knit instead. But for some reason, the desire to crochet has never left me. I’ve been trying multiple styles of “ergonomic” crochet hooks, and I’m finding that I can crochet, as long as I only do it in short bursts and take frequent breaks. So, yay for that! The original hat starts with a circle. Easy enough, right? Apparently that part of crochet wasn’t coming back to me so easily. I don’t know how many times I started this project, over and over, but the counts were wrong. Now, they’re finally on track. So, I think I’m on my way! 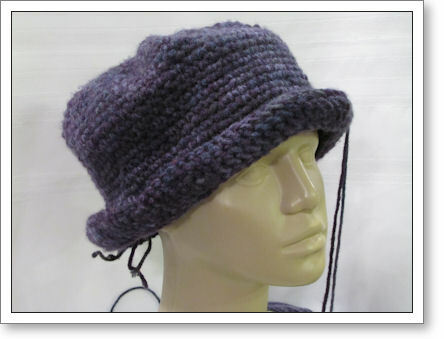 The other thing about the original hat was that it was made from cheap acrylic yarn, held doubled, on a hook much smaller than usually required for that thickness of yarn. This is critical for the hat to keep it’s well-defined shape. So I’m using a worsted acrylic, double-stranded, on a size G hook. This hat will be able to stand up on its own. So, what you’re seeing here is just a beginning. But, I think I’m on my way. Hopefully this won’t take long! I want to wear this hat THIS winter. Wish me luck! Yesterday I went out and got my nails done. i consider this to be a major accomplishment, given that I was coming down off of what was an unusually sucky New Year’s weekend. Not that we ever do anything too exciting, but the friends that we had planned to have over for a quiet celebration had all pooped out on us, and I was bummed. So I picked an unusually intense shade of purple, kind of a dark, gothy shade. It’s one that I’m sure I’m supposed to be too old to wear. But dangit, I like it. So there. On my way back to the car from the nail salon, I popped into the bookstore, intent on having my last gingerbread-latte-hurrah of the season. Of course, rather than making a beeline for the coffee counter, I snaked my way through the magazine rack. And, ooh-boy, am I ever glad I did. Look what I found! It’s the Knit Simple Knits Plus: Great Fit, Great Style! “Bookazine.” It features 50 patterns in larger sizes, and there are quite a few things in there that I’d consider knitting. It’s great to have so many patterns to choose from all in one place. While I’m talking about cool new stuff, I have to mention the Kindle Fire I got for Christmas. I love it! So far, my favorite part is the interactive magazines. I’ve subscribed to several, including one knitting magazine. It’s Your Knitting Life! magazine, which I don’t think I’ve ever actually seen on a newsstand, but, I think I like it ok. I think this is going to be a good tablet solution for me. The iPad is just a bit big and heavy for me to handle, plus I never get to use ours very often because the kids are always on it. 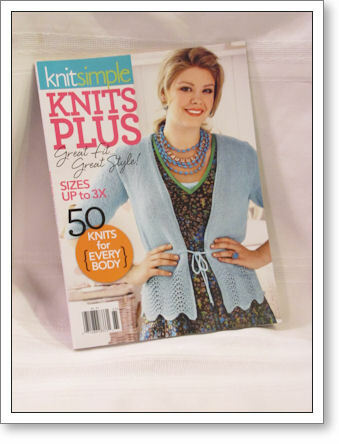 Plus I’ve already added some PDF files of knitting patterns I’m working on, so now they’re always handy. I’m looking for other ways to use my Kindle for knitting… so if you’re out there and you’ve figured this out already, let me know. So I’ll be in my little corner, knitting and reading, and knitting some more. I’ll try to poke my head out and say hi once in a while.